A 35-year Senagalese man who was saved by Spanish lifeboat after making a perilous journey from Africa was celebrating his win of € 400,000 in the Christmas lottery. Eight years ago he arrived in Spain with nothing. But on Tuesday, Ngagne cried with joy as he realized all his dreams had come true with the purchase of lottery ticket. He was one of thousands who bought a ticket with the number 79140 from a lottery shop in the Andalusian seaside town of Roquetas de Mar. The number won the top prize of El Gordo – the 'fat one' – in Tuesday’s draw, netting the town of 90,000 people a change in fortune. "I want to give thanks to Spaniards and the Spanish government for rescuing me when I was in the sea," said the Ngagne, choking back tears of joy as he appeared on television outside the lottery shop where the winning ticket was sold. He later described how hard life had been since leaving his home in Senegal in 2007. "There were 65 of us in the patera," he told La Voz de Almeria, describing the stricken wooden boat in which he had travelled with the woman who is now his wife. Since arriving in Spain, the pair have tried to survive on temporary agricultural work as vegetable pickers in the greenhouses that cover much of that corner of Almeria. "I just can’t believe this," he said gripping his winning numbers. " I can say that sometimes we haven’t had five euros between us a day…"
Ngagne also chose to remember his last employer in the greenhouses, who recently laid him off. "This is a souvenir to Antonio, who told left us to fend for ourselves," he quipped. 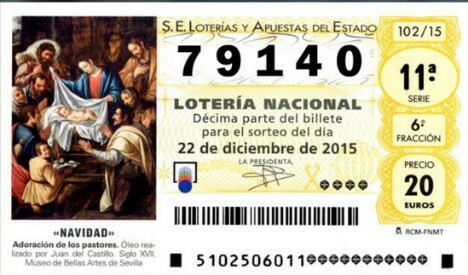 The winning number appeared on 1,600 'décimo' tickets sold exclusively from the lottery shop located at number 19 on Avenida de Roquetas. Some 85 percent of the tickets were sold with each décimo - the €20 share of a tenth of a full ticket - winning the top prize of €400,000 before tax. One school in the nearby Alpujarras had bought up almost half of the winning tickets in a fund-raising scheme to fund a student summer trip. The school in Laujar de Andarax ended up selling 800 tickets to friends and family winning a total of more than €300 million. "Nearly everyone here has a ticket or a share in one," the town’s mayor, Almudena Morales, told the news agency Europa Press. "People are going crazy, nobody can believe it. The money went to down-to-earth people who work hard and who really needed it." One couple from Aragon had bought the winning lottery ticket while on a recent holiday to the seaside town. As well as buying one décimo each, they bought seven others for friends and family, earning the group a combined €3.6 million. While José Martín, (pictured below) the vendor of the winning ticket, has become a local hero, he admitted that "sadly" he had failed to buy any of his own stock.